Innovation is increasingly a critical competency for all businesses – in today’s global, dynamic markets. But many businesses lack effective capabilities in innovation. Our latest video on our YouTube channel looks at innovation challenges and the use of ‘best practice’ assessment to drive innovation improvement. We also overview the use of the Codexx ‘Foundations for Innovation’ (F4i) assessment solution – developed in 2006 with the support of John Bessant, then Professor for Innovation at Imperial College Business School in London. And we do all this with a light sprinkling of humour…. and why not? How healthy are your legal services? Today law firms must compete on the basis of their legal services – not just their lawyers. Clients buy legal services to get problems solved and these services are typically delivered by lawyers – but with increasing competition, the impact of IT and the internet and deregulation in some markets, this is changing. With the aim of meeting client demands of ‘more for less’ and doing so profitably, progressive firms are giving increased focus to improving the value of their services and the efficiency with which they are delivered. Twenty years ago ‘legal services’ were simply the aggregate outcome of the work of a number of lawyers with a specific set of skills. The way the work was performed and delivered varied by office, by partner, by fee earner and over time. There was little consistency in how the service was performed or delivered. The legal world is very different today. To find out more and how you can assess and improve your legal services read our new whitepaper: How healthy are your legal services? If you would like to know more about Codexx experience or services in this area, please contact us. The UK legal press primarily gives coverage to the large law firms – particularly the so-called ‘magic’ and ‘silver circle’ firms licensed in England and Wales – and how they are responding to market, regulatory and technology challenges. But how are mid-sized regional firms dealing with these challenges? These firms are typically competing for work where rates and indeed margins are significantly lower than for the large firms competing for M&A and complex litigation work – and these are being further squeezed in this challenging environment. To better understand the challenges and effective approaches for making major transformation in such a mid-sized law firm we returned to one of our legal clients with whom we worked in 2011-12 on a Lean programme. 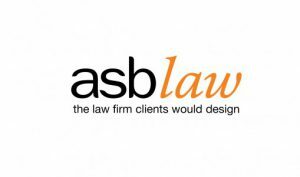 At that stage, ASB Law, a progressive south coast firm, was just starting out on a programme of major transformation. We interviewed Andrew Clinton, who has been the Managing Partner of the firm since 2006. He has been championing and leading the firm’s programme of transformation. Andrew was open and frank about the firm’s approach to transformation, its challenges on this journey and its achievements so far. He agreed to the documentation of this interview in a Codexx whitepaper and sharing it in the public domain. 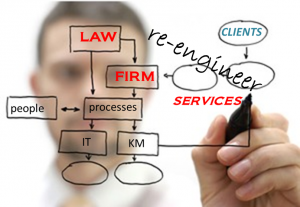 We have done so and also added a commentary based on our re-engineering and innovation experience with multiple firms in the legal sector since 2005. This paper provides a practical and detailed review on the approaches, challenges and lessons learned in making and sustaining major transformation in a mid-sized law firm. We have also included a framework for the effective design and management of transformation programmes. To read the paper click on the link below. Law firms are facing increasing business challenges due to the impact of globalisation, clients wanting ‘more for less’, deregulation and of course the impact of Information Technology and the Internet. These challenges have driven progressive law firms to seek to improve their competitiveness by redesigning their services and support processes to improve the value delivered to clients and also the efficiency with which services are delivered. Our new whitepaper explores the redesign of legal services – the reasons firms take this step, the approach used, the challenges faced and the benefits realised – using our experience gained in redesigning 20 legal services and processes for major English law firms between 2005-16. There has been an explosion of interest in information technology in the legal sector of late – particularly technology at the leading edge such as Artificial Intelligence (AI). This interest was crystallised in the recent and well publicised ‘Legal Geek’ conference in London when a number of major law firms mingled with ‘LawTech’ companies and startups to discuss how new information technologies and new thinking could be used to transform ways of providing legal services. As well as AI and technologies such as blockchain the conference looked at ‘softer’ elements such as innovation and cultural change. This is a significant development in a business sector that has long been conservative and behind other sectors in its application of new business thinking and technology. It comes as many firms law struggle to maintain their levels of profitability in market conditions that have been challenging since the 2008 financial crash. The combination of price-focused clients, globalisation, the internet (and market deregulation in the UK) has driven law firms to seek to innovate in the services they provide and the ways they work. Law firms typically have applied IT for legal research, case and document management and for the management of support activities such as time recording, billing and finance. This new wave of IT brings internet-based technologies and – what typically makes the press – Artificial Intelligence (AI) systems. The application of these new technologies promises to revolutionalise the way law is provided – for the benefit of law firms who can work more efficiently and effectively – and for the benefit of clients who will receive ‘more for less’. The implementation of these technologies will – over time – help in digitizing key elements of legal services – making law more affordable and accessible to the large unmet market of small businesses and individuals. Having worked for the last decade in helping major UK law firms transform their services through re-engineering and innovation – and also one who has consulted to multiple business sectors for twenty-five years – I am feeling a sense of deja vu. In the 1990s, the industrial sector was in the midst of an ERP frenzy – implementing new Enterprise Resource Planning systems such as SAP and Oracle to transform the efficiency of their business operations. In the late 1990s and into the 2000s, the next wave of technology looked outwards into SCM (Supply Chain Management) and CRM (Customer Relationship Management) – to better link business with their suppliers and customers. In both these ‘tech frenzies’, many companies suffered from implementation programmes that significantly overran their budget and plan and failed to achieve their business goals. 1. A vision & strategy are required for effective communication within the business, getting buy-in from key stakeholders and coordinating the resources and activities. 2. 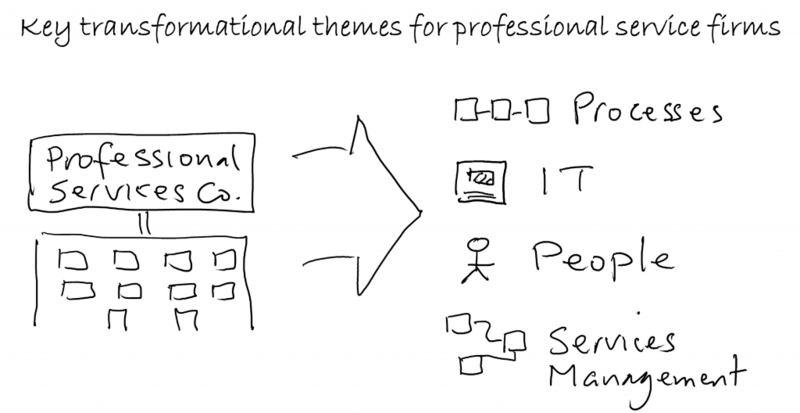 To get the best out of the IT, business processes need to be re-engineered first (to avoid the all-too-common ‘pig in lipstick’ outcome). 3. Effective programme management is required for effective coordination of IT, process and people work-streams. 4. 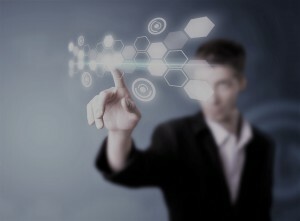 Change management is fundamental to effectively deploying the new technology and working methods into daily business. Are law firms grasping for a silver bullet? New technology can often be an attractive ‘silver bullet’ for management teams faced with major business challenges. It appears as a nice ‘clean’ solution to a firm’s problems – as compared to complex messy process and organisational-based improvements. For this reason many businesses have wasted money and sub-optimised the impact of their technology investments by not ‘preparing the ground first’ with re-engineering and restructuring work. We should also be clear that those law firms currently looking to apply new IT such as AI systems, are typically larger firms – the ‘Top 50’ in the UK – not the other 10,433 firms*. These are the wealthier and more sophisticated firms. However in my re-engineering work with these larger firms in the last decade, it is clear that their services and processes have much opportunity for improvement. Re-engineering projects have typically yielded 25-50% cost reduction – whilst improving service quality – without the application of any new technology. These services simply were not designed or operated in a systematic and efficient way. Automating them without re-engineering them first would significantly reduce the benefits from IT investment. Indeed for smaller firms lacking the capital or the resources for major IT investment, internal re-engineering work would be a better approach for now – then later exploit the use of these new technologies when prices have reduced and functionality improved. So law firms should look outside their sector and seek to learn from others’ experience on how best to truly transform their businesses by exploiting new technologies and thinking. They should strategically evaluate – and incubate – these new technologies to determine how they can be used to re-fashion their value proposition and their business model. They should prepare the way by first systemising their services and processes. And they should manage the implementation of these new technologies as an holistic programme. For more information on law firm innovation, see ‘Innovating professional services – transforming value and efficiency’ by Alastair Ross, published in May 2015 by Gower. * There are 10,483 law firms registered in England and Wales in September 2016 according to the Solicitors Regulation Authority. Cut the sunshine and the smell of roses and cue fog and the sound of shouting and clashing swords. Back to the reality of merger. Because it’s tough to do well. Especially in a knowledge-intensive people-based business – like a law firm. Getting the most out of a merger demands a bold vision for the new firm, a structured approach to achieve it and a clear picture of capabilities in each of the merging firms. There are very few cases of effective post-merger integration and optimisation in law firms. Many firms seem content to settle just for the larger scale that merger provides. Why is this? An obvious reason is that making the most of a merger requires significant change and that is challenging in most law firms. The partnership model is very effective at resisting centrally-driven ‘mandated’ changes. 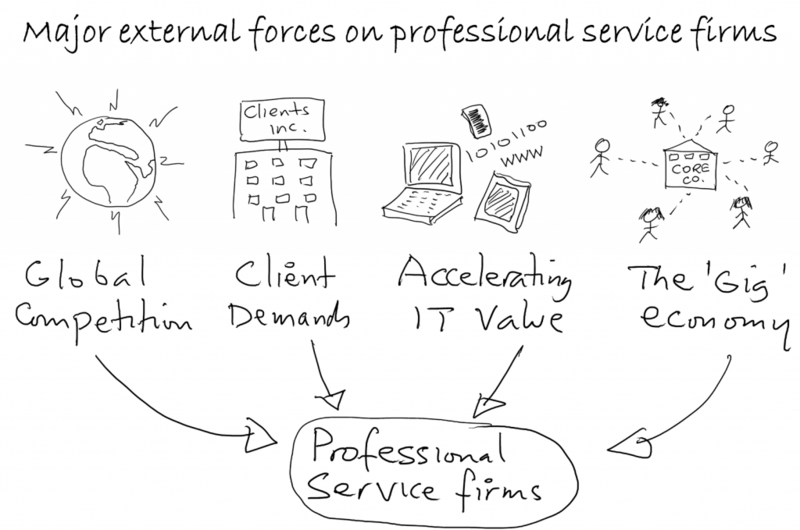 Firms also do not typically operate or like ‘process thinking’ and typically resist standardisation of working. I’m using a thick brush to paint a crude picture here – but it is a recognisable one for most law firms – and it makes effective mergers a challenge. On top of this basic challenge is the fact that firms don’t typically have a vision or a programme for ‘post-merger optimisation’. Before the first step: What’s the vision? A challenging vision for the new firm that provides an improved level of competitiveness based on exploiting the potential synergies in the merged firms should be the starting point. A key first step is to objectively assess the services and processes in the merged firm to identify best practices and performance (i.e. where is the ‘one best way’ in each service/process element). The next step is to establish common processes and services, based on existing best practices (i.e. the ‘one best way’) that are standardised across the firm. This work can be part funded by the savings from realising the economies of scale in support and in the purchasing of products and services. The appetite of major law firms over the last few years to merge and create major – often global – law firms has created major national and international operations, some with yearly turnover well in excess of £1 billion. These mergers provide clients with increased support and a range and depth of legal capabilities – and thus increase the firms’ potential competitive position. However such mergers also further challenge the existing operational methods within these firms for effective and efficient service delivery and the optimisation of support processes. 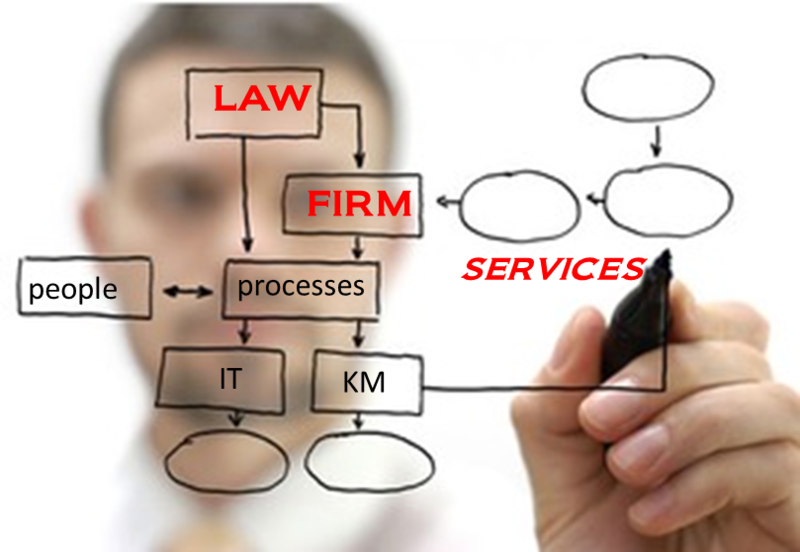 Law firms typically lack the systematic approaches of services and process management and innovation. This is a weakness that will need to be addressed if these firms are to operate profitably in a services market that is increasingly global and digitally-enabled. Director’s blog: Can you really train people to be innovators? Raising the level of innovation is becoming a critical need for businesses as they face increasing competitive pressures. A fundamental requirement for making businesses more innovative – in what they provide to their customers and how they do so – is to get their managers and employees engaged and able to effectively participate in innovation activities. This requires an internal system for innovation that establishes key elements of enabling innovation infrastructure such as strategy, processes, tools and supporting resources. And part of this work involves training managers and employees in innovation. But can you really train people to be innovators? I ask this question, as there is a view – and not an uncommon one – that innovators are born not made: “Just look at Steve Jobs, James Dyson or Jeff Bezos – they weren’t trained to make them the innovators they are!” Implicit in this view is the belief that when it comes to innovation ‘you’ve either got it or you haven’t’. If that’s the case then what hope is there for businesses trying to innovate if they don’t happen to have a Jobs, Dyson, Bezos or the like in their midst….? Let’s step back and review a few innovation basics: Firstly, people often mix up innovation and creativity. Creativity is about generating ideas. Innovation is about creating value from ideas. Ideas on their own have no value – only potential value which has to be realised. Certainly some people are naturally more creative than others and thus more likely to generate potentially valuable ideas. But being creative alone is not enough – we also need the skills to realise the ideas and transform them into value. That requires skills in idea exploration and analysis, development of new offerings and methods, project management, marketing and selling (internally and externally) for example. And ideas can be effectively generated by (less creative) people working systematically anyway (through effective brainstorming and other ideation methods). So innovation requires a mix of capabilities, not just creativity. When talking about improving innovation in an organisation it’s important to remember that the goal should be to ‘institutionalise’ innovation – to enable regular and sustained innovation through widespread and integrated efforts – rather than the occasional spark of innovation enabled by a few individuals (who can have off days or can leave). People forget that Apple’s innovation success with its iPod, iPhone and iPad was the result of multiple innovations by many individuals with Steve Jobs being the orchestrator and very much the public face, but by no means the sole innovator – and indeed his orchestration was ineffective and inefficient at times (read the excellent biography ‘Steve Jobs’ by Walter Isaacson for details). One of the earliest examples of effective institutional innovation was the Menlo Park laboratories established by Thomas Edison in 1876. This was one of the first large-scale research establishments and formed the template for R&D organisations for the next fifty years. Edison brought together more than 200 talented scientists, engineers and craftsman and overlaid a system of innovation that harnessed their skills in a structured and productive way with defined teams, extensive experimentation and record keeping. It was a highly productive operation and created more than 400 patents. Whilst Edison was very much the public face of innovation, it was very much an institutional rather than individual approach to innovation, with defined targets such as ‘a minor innovation every 10 days and a big thing every six months or so’. 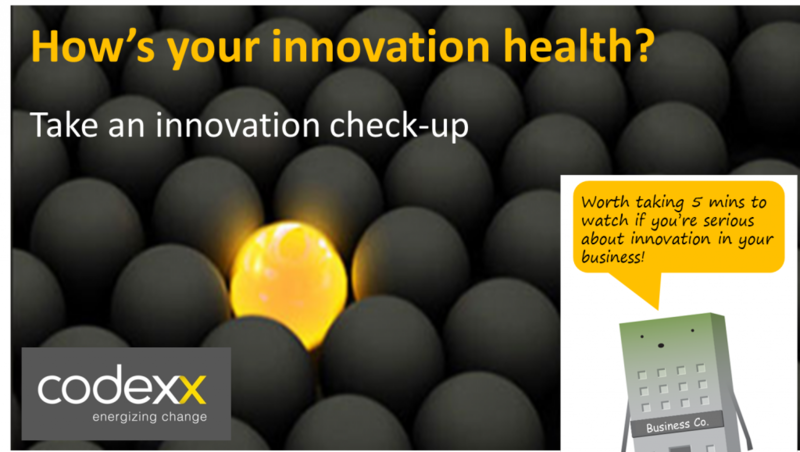 A more modern example in a services firm is that of AXA Insurance in Ireland which started up an innovation programme in 2000. Theirs was very much an experimental approach, learning as they went along. They found that they could generate lots of new ideas from their employees but they needed to apply a process to effectively screen and select the best ideas. One key insight was when they analysed the ideas implemented in their first few years of the programme they found that 80% of them were concerned with removing waste or improving existing services or ways of working. Only 10% were ideas for new innovative services. This finding helped demystify innovation in the business – employees realised that most innovation was in doing existing things better – incremental innovation – which they could certainly do in their daily work. That is a powerful message for all businesses: Don’t just look for the ‘silver bullets’ of radical innovation, spend most of your time removing the ‘rust and grime’ from your existing methods and processes and then ‘polish them’ to make them more effective. Industrial experience of Continuous Improvement, making use of basic techniques for measurement, analysis and waste elimination – often within a Lean programme – has shown the power of such ‘do better’ innovation. Training employees in these core techniques can make them more structured and effective in their work on process innovation. So you can train people to become innovators? To help answer this question I’m going to use the example of the UK legal sector. Most observers would not consider law to be a natural environment for innovation and rather unkindly might jest that ‘lawyer’ and ‘innovative’ are two words never found in the same sentence… That might well have been true(ish) twenty years ago, but it’s a viewpoint that is increasingly out of date today. For the UK legal sector has been in a state of major change for the last decade, driven by a combination of deregulation, tougher market conditions driven by the economic fallout from the 2008 financial crash, and the increasing impact of the internet. The result is clients ‘wanting more for less’, new rivals, internet-enabled entrants and law firms recognising the need for major changes in both their offerings and their working methods. Many have embraced innovation in their services – often with a primary goal of efficiency and cost improvement. In my work with law firms since 2006 I have helped law firms re-engineer a total of 20 legal services using a Codexx approach called ‘Smarter Working’. This approach uses a small core team of fee earners and support staff to perform the re-engineering with the support of the Codexx consultant. We effectively establish a ‘micro innovation environment’ using collaborative workshops and with training in team-working, some basic Lean principles and creative idea generation methods. This has resulted in major redesign of services such as Commercial Due Diligence, Inquest and Clinical Negligence, to reduce costs by as much as 75% whilst improving service quality. It has also resulted in the development of new internet-enabled services. Looking back at this work over the last decade I can unequivocally say that you can train lawyers – or indeed any other employees – to be very effective innovators within a supportive environment for innovation. Other law firms have wanted to take a broader approach, not just focused on selected services, but to make their firms ‘more innovative’. Their goal was a firm that used sustained innovation to improve its services, its efficiency and thus its competitive differentiation and its attraction as a place to work for progressive lawyers. To help them do this I have applied Codexx methods and tools to help them establish a systematic approach to innovation and use this to drive innovation of new and improved services and working methods. This work included strategy development, an innovation process & support structure, change management and of course training for selected personnel. From my experience a key strategic approach to establishing innovation on a firm-wide basis is to run two parallel missions: the first to build the required innovation system and the second to deliver innovation outcomes (e.g. improvements, enhanced services etc.). The first mission is key to long term innovation success; the second is key to delivering benefits early and to help gain buy-in through demonstrable early success. I have delivered training on innovation to selected personnel in a number of firms (often innovation ‘champions’ whose role is to spearhead innovation activities) and typically found lawyers receptive and able to effectively apply the new methods – generating both incremental and more radical ideas. Based on this, there is no doubt in my mind that these lawyers and support personnel can be very effective in catalysing and supporting innovation within their firm. That is of course if they are given the ‘space’ for innovation. Unfortunately these are not always put in place or sustained to accompany training for innovation – and then all the teaching in the world on innovation will have as much effect as trying to light a fire on boggy ground…. To read further about Thomas Edison’s approach to innovation and the Menlo Park research organisation, see a delightful and informative book on innovation: ‘Innovation – a very short introduction’ by Mark Dodgson and David Gann, published by Oxford University Press.